Leaving Cert reform will be vehemently opposed by secondary school teachers if it involves any element of teachers assessing their own students for critical exam marks. The Association of Secondary Teachers of Ireland (ASTI) warned Education Minister Richard Bruton they will not tolerate a repeat of controversial Junior Cert changes with Ireland's world-renowned Leaving Cert. 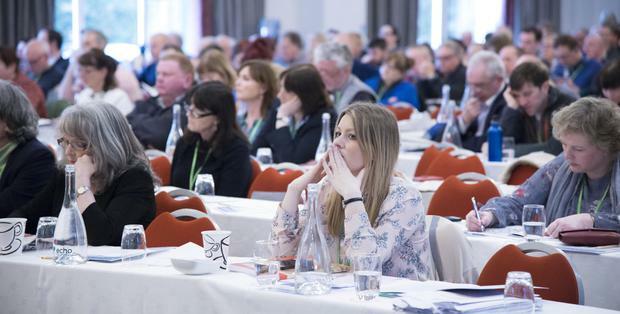 Four separate motions at the ASTI's 96th annual conference in Cork dealt with mounting concerns over the Junior and Leaving Cert exam changes and support resources. A Mullingar branch motion was unanimously supported by the 400-plus delegates which warned that the ASTI now develop an opposition campaign "to any attempt to introduce assessment of students by their teachers for certificate or accreditation purposes at senior cycle." Three other motions - from ASTI branches in Clare, Waterford and Dublin South - raised concerns over specific Junior and Leaving Cert changes. The Dublin South County branch warned in one motion that educational standards had fallen as a direct result of the controversial new Junior Cert structure. Joe Scally from Mullingar warned that such controversial changes could result in "the hideous erosion of the value and independence of our flagship exam." "We must not be led by vested interests - we are supposed to be the experts. Let us direct the debate." "The currency of the (Leaving Cert) exam would be devalued with Junior Cycle (style) changes." Clare delegate Pauline Nagle warned that ASTI members predicted once the Department of Education got their way with the Junior Cert they would attempt to change the Leaving Cert. "No one here wants to go through the nightmare that the Junior Cert turned out to be," she said. Peter Keaney of Westmeath said there can be no question of teachers assessing or certifying their own students as part of a Leaving Cert exam. "We need to stress the quality and fairness of the present Leaving Cert," he said. One delegate challenged perceptions of rote learning. "The problem is not with assessment - the problem is with cramming all the Leaving Cert exams into just one or two weeks," he said. ASTI officials stressed they were not opposed to sensible Leaving Cert change - and welcomed the introduction of such subjects as Computer Science and Physical Education. But ASTI general secretary, Kieran Christie, bluntly warned the Government not to repeat the mistakes over Junior Cert reform with changes now proposed for the Leaving Cert. "ASTI is not opposed to reform per se - (but) we want quality reform which is in the best interests of the students we teach and the system we work within," he said. "Complacency has no place in our education system." The ASTI boss warned that teachers are vehemently opposed to assessing their own students for Leaving Cert exam purposes. "That is something that is not going to change - ASTI supports externally assessed State examinations not for selfish reasons but because they meet the professional requirements of any national examination that is fair, transparent and objective." Mr Christie said Ireland's Leaving Cert boasts a deservedly high international reputation. "This is precisely because it is underpinned by the fact it is domestically and internationally perceived as meeting the criteria of fairness, transparency and objectivity." The ASTI boss also warned the Government to learn from past mistakes and ensure any process of Leaving Cert reform is achieved through careful consultation with teachers. "You cannot have radical curriculum change without a parallel process of engagement with the teaching profession," he said. "If the bitter experience of recent years teaches us anything it is this." Mr Christie warned that the last thing Ireland needed was another prolonged dispute between teacher unions and the Department of Education over exam reform such as that experienced with the Junior Cert. "Teachers deserve to have their professional knowledge and experience respected and to have their concerns listened to." "This is the way forward in ensuring that teachers have confidence in any curriculum model." "I believe the ASTI can hold its head up high in all that it did and continues to do in protecting standards in Junior Cycle." "We owe nobody an apology - we can legitimately take a bow."